The Baltic Sea is frozen by several tens of centimetres of ice. But in the guest harbour of Nagu, there is a pump that keeps the water flowing in order to create a "vak", Swedish for a hole in the ice. 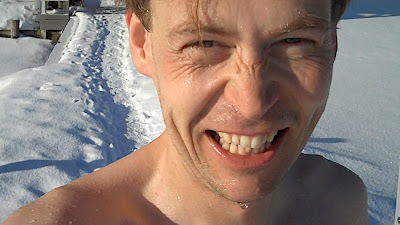 The purpose of this particular "vak" is to allow the Nagu inhabitants to go swimming. 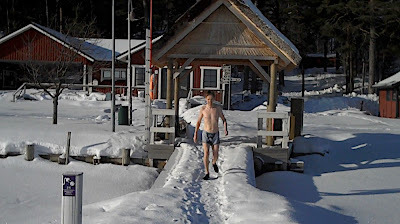 This happens mostly during two sauna events in the week, Wednesday evenings and Saturday mornings. 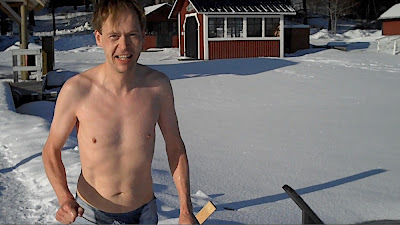 I had the good fortune of being in Nagu now this Saturday morning, so I decided to go for my first winter bath of this season. In basking sunlight and without any wind, the conditions were near perfect. It's not far from the Sauna to the ice hole, so one didn't even get noticeably cooled down on the way to the hole. I don't recommend to spend too much time on second thoughts before going into the hole. Afterwards, the only really cold body parts are the feet. My diving shoes are, as one can expect, filled with water. The water is cold and wet; I prefer to empty the shoes of the water, rather than warming it up with my feet. Having got rid of the water, I can devote myself to the endorphine high. There was no need to consciously change my facial expression. The smile was automatic. 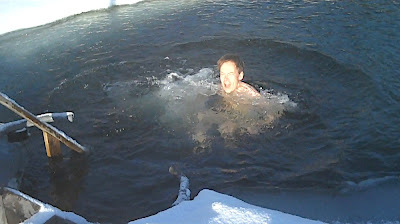 This is how it feels like after winter bathing! When I came, there only two other bathers on the men's side. The pictures were taken during the first round. The second and third round, I went in alone. 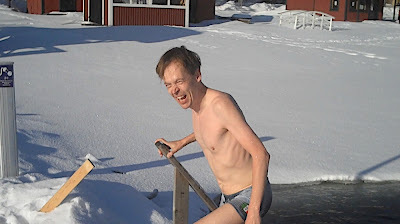 The fourth time, I went with Larry Lindroos, the gentleman who introduced me to the concept of winter bathing a few years ago.